Here we first meet the progenitor of one of the more well-known fads of the nineteenth century, the 1872 craze for the pretty Dolly Varden. The red-lipped, flirtatious, locksmith’s daughter who attracts men to her like bees, Dolly was probably the most memorable character of Charles Dickens’ Barnaby Rudge, which first appeared in 1841. The novel, Dicken’s first of two historical novels, is set during the anti-popery riots of 1780. In her cherry-colored hat ribbons and bright polonaise dresses, she was a reader favorite, and a favorite of her creator, too, who kept a portrait of her in his home. I am only guessing, of course, but the London’s Tate Gallery holds a portrait of Dolly Varden flirting with the viewer in her red ribbons, painted by Dickens’ friend William Powell Frith, after the book was published: maybe this is the same painting? 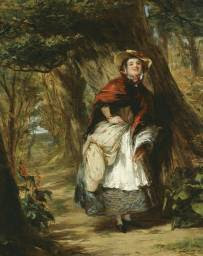 Painting: "Dolly Varden", William Powell Frith, circa 1842-1849. Tate Gallery, London. Products galore were named for her. “The Dolly Varden Polka”, and other music, note paper and envelopes (Boston Daily Globe, May 6, 1872), cigars (see http://www.civilization.ca/tresors/cigares/cigarbox027e.html, oh, and cakes, and poetry. More on that later. 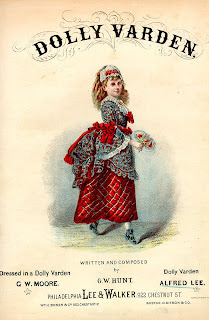 Sheet music cover: a young girl wearing a Dolly Varden dress. "Dolly Varden". Words by Frank W. Green; music by Alfred Lee. Philadelphia: Lee & Walker, between 1872 and 1875. From Keffer Collection of Sheet Music, Penn Library, Department of Special Collections. The name made its way farther afield, too: A mine in Nevada opened and was named the Dolly Varden; an explorer of the Dakota territories, Julius Chambers, gave the moniker to his canoe and also to a lake; a political party took up the name; and famously a woman accompanying fishermen on expedition spotted a pink-spotted char and compared it to Dolly Varden; the fish has sported the name ever since. There was even a race horse named for her: she ran at Prospect Park, noted the New York Times in October of that year. Let's not forget the cake. Do see one of two of the earliest recipes I could find online for it, dated 1881, in Emma Whitcomb Babcock's Household Hints (p. 54). In Barnaby Rudge, Dolly Varden is described as wearing rather colorful, even flashy clothes. Do a search of the Gutenberg.org online text of the story, and you'll see what I mean. The craze apparently started sometime very early in 1872. 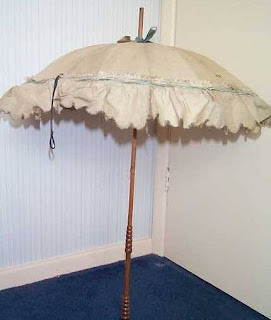 Photo: Dolly Varden style parasol on Corsets and Crinolines site. For those who hadn’t read the novel, the Portsmouth Times, among other papers, gave them the background information they needed to make a good purchase. NELLY—Well, then, my Dolly Varden and your walking-suit will see the light together. MARY—You mean thing, you—to have kept it all to yourself. That’s what I call real selfish. NELLY—I don’t know—never thought of it. Varden sounds French. NELLY—I’ll find out when I go to the milliner and try on that hat. Such a dear cocked up little conceit of a thing, with a bunch of straws and butter-cups in it. You could most eat them. Ouch. If you read the rest of the article, it’s even ouchier. The Times was having a good poke at the nouveaux riches. Nota bene: Worth was a carriage-trade French couturier, with the patronage of queens and duchesses, Astors and Vanderbilts, but, of Smiths and Jones too. The color of money was all he needed to see, though he didn’t advertise it. "At the mere mention of Barnaby Rudge, the locksmith’s pretty daughter stood before us. Strange that we could have forgotten her,—the sweet, fresh, jaunty English lass, trim, neat and coquettish, with her bright quilted petticoat, and her gown caught up daintily and pinned at the back. The locksmith’s daughter, as we know, was no heroine. She advocated no great public principle, suffered in no noble cause. She was just a good, pure, everyday girl—and that is why we love her. Her name is a character in itself. All Dickens’s names are. It means freshness and spring-time and guileless dressiness. And so Dolly Varden is made the presiding genius of the dry-goods world to-day." In England, the fashion seems to have been a primarily middle-class phenomenon, carefully eschewed by ”the best people” in the upper echelons of society, as Cunnington put it. Song sheet Cover: "Dolly Varden". Music by H. Werner, words by F. Wilson. 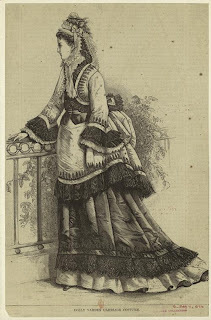 In this drawing the young woman is wearing a rather untrimmed, flowered Dolly Varden polonaise with plain "petticoat-style" underskirt at the seaside, a fashionable venue for wearing this sort of ensemble. Library of Congress. ‘ ”Does the dress suit? For we have no time to throw away,” says she [the cousin]. Music sheet cover. "Dolly Varden Polka" 1872. A fashionable young miss in her Dolly Varden ensemble, giving a good view of the tilted hat. Her flowered dress is obscured by a plain mantle or shawl. Library of Congress. Our Young Folks took the opportunity in August to publish a morality tale about a young lady named, naturally, Dolly, who with such a pretty Dolly Varden dress on, takes off to the fair and acts out like, well, her namesake, with the expected result of any morality tale, she gets into trouble. It's actually a charming little story, with the most charming little sky-blue dress. Do read "Dolly Varden", if you have a chance. There was plenty more humorous comment along those lines, if a search of newspapers is any guide. This is a Dolly Varden carriage costume from Harper's Bazaar, May 11, 1872. (From NYPL Digital Collection, #803909). 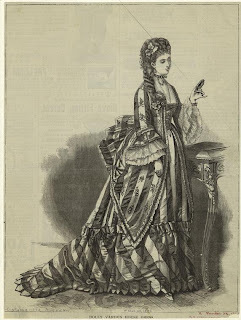 Here is a Dolly Varden house dress from Harper's Bazaar, March 23, 1872. (From NYPL Digital Collection, #803737). Please also have a look at the glorious Dolly Varden walking suit in Stella Blum's Victorian Fashions and Costumes from Harper's Bazar, 1867-1898, if you have a copy. If you don't, see the Google Books version. 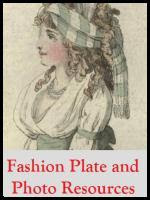 Sadly, only one of the three fashion plates, the last one, features the fashionable floral fabric, and you must look very carefully at the front view to see the patterning. Certainly florals would something to depict easily in an already very busy fashion plate, but the plates do show just how wide a variety of stylings fit under the Dolly Varden umbrella, or should I say, parasol? 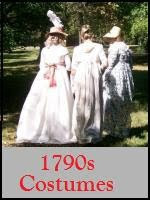 Use of 18th century type fabrics: stripes with florals, especially on bodice/polonaise. In many but by no means all cases, underskirt was plain or quilted (the latter to imitate 18th century quilted petticoat convention. Use of a polonaise, although as Cunnington states, early versions of the polonaise in this year could be constructed with a separate bodice, with basques in front and short ones in back, and a separate tunic overskirt, long in front and short and puffy in back. Sleeves ending in 18th century style flounces. Self-fabric ruching and similar 18th century style trims, although these were pretty universally used on dresses during this time. Sweet fragment of the Master’s art! In life’s dry, dog-eared pages! His wife a Dolly Varden. And bought a Dolly Varden. *One tiny note: get the pun? The Grecian bend was a popular stance women took at this time, slightly bent forward. Read about in Cunnington. Addendum, March 21, 2011. How interesting. Just found out that the Wikipedia entry about the Dolly Varden costume links to this article. Neat! I have an original "Dolly Varden Polonaise" pattern dated 1889. I'm trying to establish it's value. Most sorry for the delay in replying! Antique patterns can have some value to them, and the older the pattern, the better. Patterns from the 1880s are not all that common, that I know of. However, because I am not a dealer in patterns, nor have bought originals myself, am unable to help you with valuation. You might wish to check with BustleDress.com, with Vintage Martini, or the Vintage Pattern Lending Library. Here's hoping they can offer you some help! We have family photos of 4 generations of girls wearing a Dolly Varden dress first worn by my great-grandmother born 1888. The dress was given away years ago before the newest generation could wear it. My goodness, now there's a neat tale. I am sad that the dress was given away; still, you have the photos, a family treasure. Hi, thank you for your very good information, i have a question about the dolly varden costume: do you know the difference between the fashion of the dolly varden in the USA and in Britain? You are welcome! From what I understand, Dolly Varden styles were embraced by all sorts of people in the United States. The first actual reference that I have seen to a Dolly Varden dress is in an upscale women's fashion magazine, and the dress is described in glowing terms. See the 2009 addendum I wrote that's inserted into the original article. Meanwhile, at least according to C. Willett Cunnington in English Women's Clothing in the Nineteenth Century, the fashion was not adopted by the upper crust. His book is quite old, however, and I do not know what later costume historians have said. Regrettably, my research did not extend to English resources. 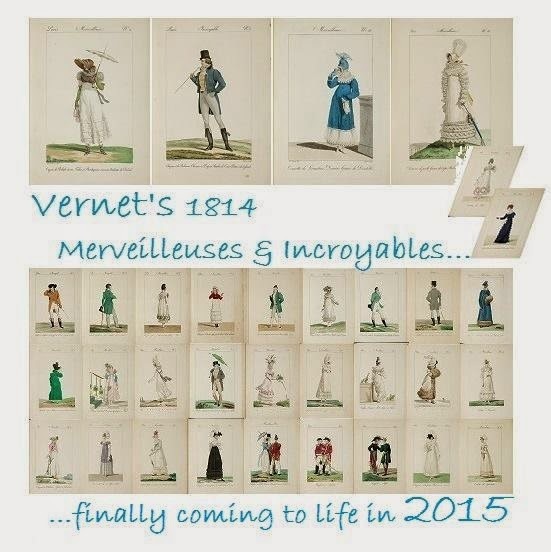 Thank you, Nathalie, so now i can do my presentation of the dolly varden dress, you've got a great blog!! Happy to help and good luck with your presentation!